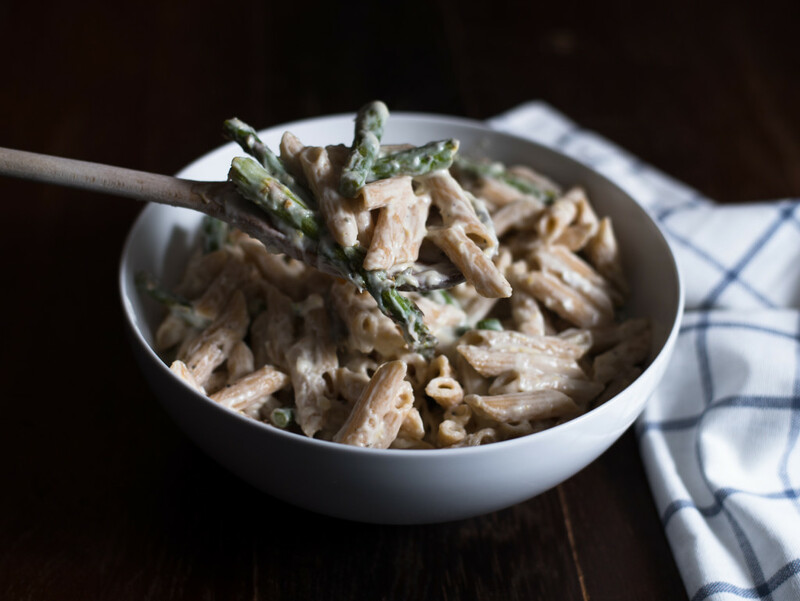 This creamy lemon asparagus pasta is a simple, vegetarian dish that is packed with flavor and is easy enough to put together any night of the week. 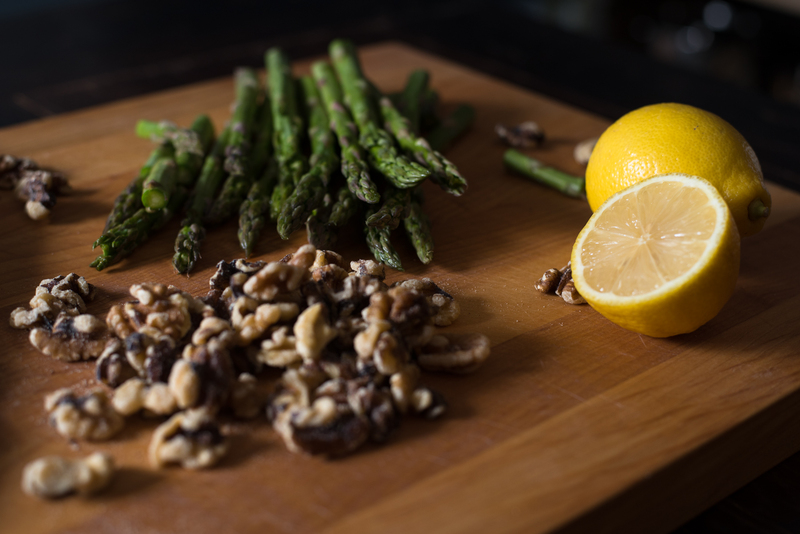 The sauce in this dish is just beautiful, and the lemon and asparagus are perfect together! Top this dish off with toasted walnuts and seriously I could eat this like five days in a row. 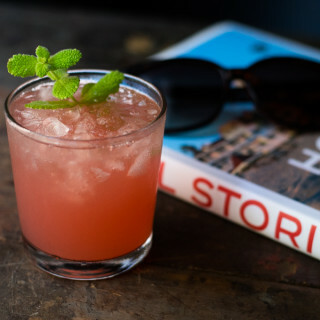 This recipe is also pretty fun because it starts with the magic of making a roux. A roux is that wonderful thickening agent made from equal parts flour and fat, usually butter. A roux is commonly used to create those amazing cheese sauces we love in classic dishes such as macaroni and cheese. This recipe also uses garlic in the roux, so the smells are RIDICULOUS! Once the flour and butter are incorporated and start to smell toasty, a roux then needs liquid to create the sauce. In this case, we used milk. It’s important to add the liquid in small amounts to avoid any lumps. Once the mixture just starts to boil, you’ll notice the thickness and know you can turn off the heat. It’s magical. Also, we’ve been trying to get into the whole wheat pasta thing. Not sure how you feel about it, but we’ve read enough about the benefits that we really wanted to try to make the switch. See, 100% whole wheat is not refined like white pasta, so it retains all the good nutrients that get lost during the refinement process that’s done to traditional white pasta. Whole wheat pasta also has been shown to help improve digestive health, and the complex carbohydrates provide lasting energy. How can we ignore all that? So we’ve been trying out the different brands, styles, and cooking times and we’ve realized that whole wheat pasta ain’t so bad as long as you know what you’re doing. The keys are to buy quality pasta (maybe not the store brand) and to pay close attention to your cooking times. 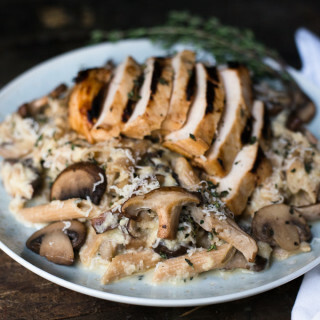 With whole wheat pasta you just can’t let it over cook because overcooking whole wheat pasta seems to have some pretty serious consequences–the pasta becomes a mushy, starch explosion. Not something you want for dinner. After I realized these simple tricks, I’ve been enjoying cooking with whole wheat pasta just as much as the tried-and-true white pasta I grew up on. And knowing that I’m using a more nutritious type of pasta helps me feel less guilty for putting pasta on the menu so often. 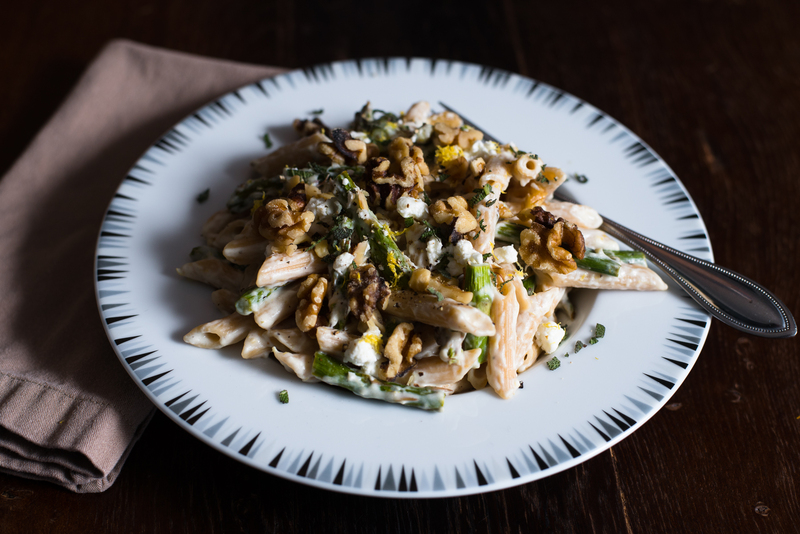 I can’t help it–it’s so yummy and there are way too many great pasta recipes tempting me. If there are other tricks out there that you’ve used to enjoy whole wheat foods, please share with us. 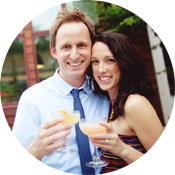 We all want to help each other find ways to incorporate the healthier ingredients without losing the taste we love. 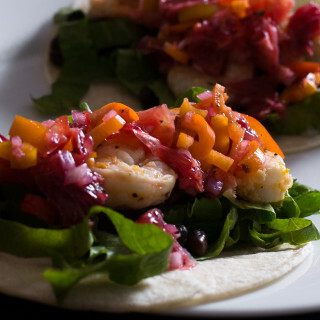 Hopefully you’ll love this recipe as much as we do. If you want to play around with some other ingredients, you could certainly can add a protein such as chicken or additional veggies such as red peppers. As usual, please do share if you come up with any variations that worked well for you. 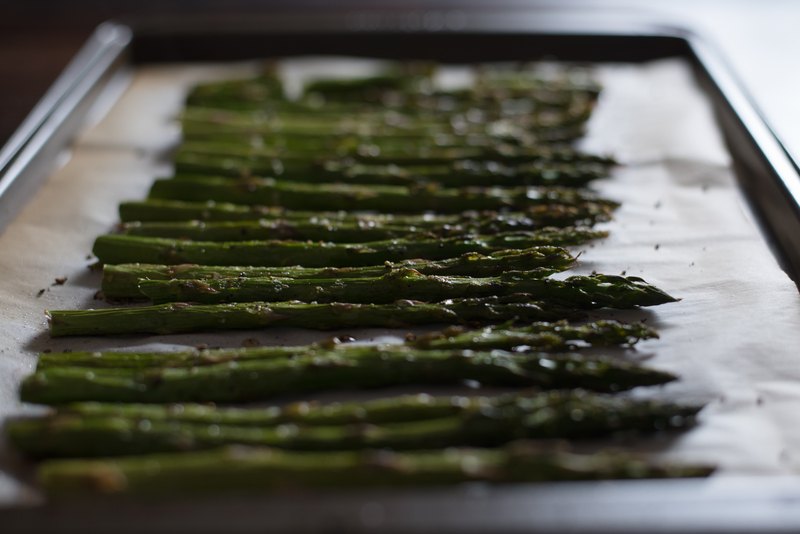 Preheat oven to 450 degrees F. Place asparagus in a single layer onto a baking sheet lined with parchment paper. Drizzle with olive oil and add a dash of salt and pepper. Gently toss to evenly coat the asparagus. Roast asparagus in the oven for about 10 minutes. Asparagus should be slightly tender but still crisp when you remove from the oven. Then set aside to cool and cut into 1-inch pieces. Cook pasta according to package instructions. Then drain pasta and set aside. Using a medium saucepan, melt the butter and add the garlic, cooking for about 2 minutes or until fragrant. Whisk in the flour until lightly browned and fully incorporated, about 1 minute. Gradually whisk in the milk, making sure that the milk and flour thoroughly combine into a smooth sauce. Then add the lemon juice. Cook the sauce, whisking constantly as it thickens, about 2-3 minutes or until the sauce JUST begins to bubble. Turn off the heat and stir in the lemon zest. 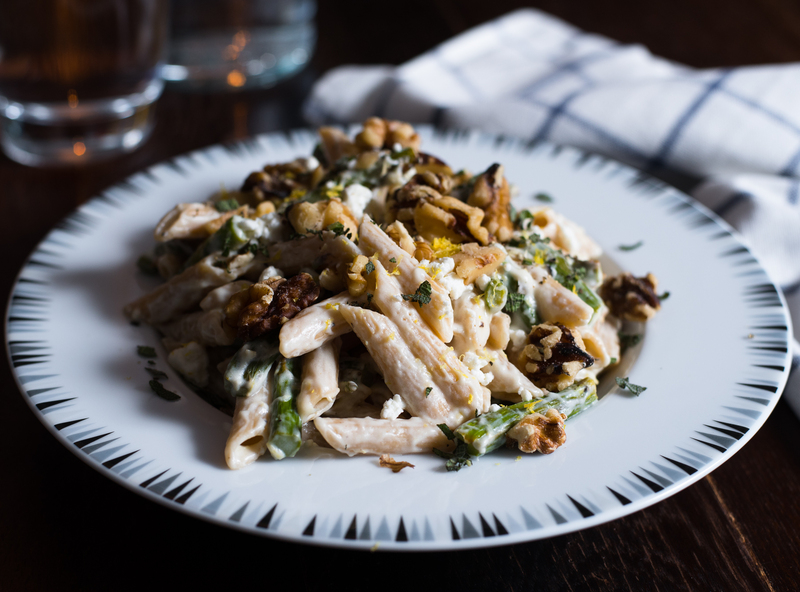 In a large bowl, combine pasta, lemon sauce, asparagus, and half of the goat cheese. 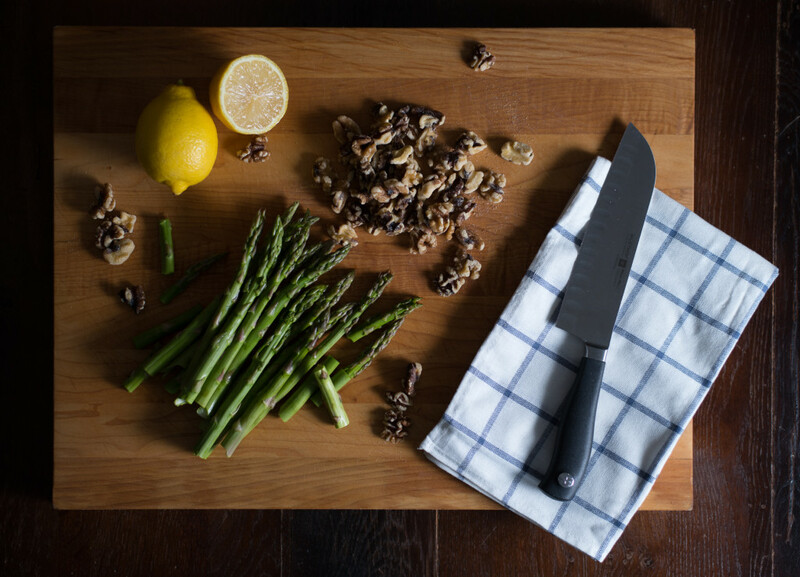 Serve immediately, garnished with remaining goat cheese crumbles, walnuts, lemon zest and fresh thyme. Yes to whole wheat pasta! Love the spring flavors you have rockin’ in this pot. Thanks so much, Erin! It’s good to have some friends who support our love of whole wheat! I made this the other night and it was delicious! Hooray! So glad it turned out so well!